* Both Mainland and Vvardenfell Factions. House Dres is one of the Great Houses of Morrowind, with presence only on the mainland. It governs the Dres District of south-eastern Morrowind from the city of Tear. 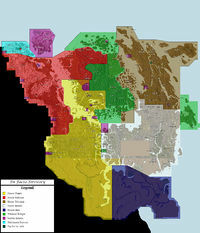 The district includes the fertile Deshaan plain, and borders Indoril District and the swamps and marshes of Black Marsh. Dres itself is a confederacy of minor houses. The council is made up of the Patriarchs of each Minor House in Dres, which still have their distinct identities, unlike the other houses. Over time, some of the houses have come under the suzerainty of other minor houses, so that a member of a different house will be their patriarch. The Dres had a mainly rural but still very wealthy agrarian agricultural society, maintaining vast saltrice plantations on the plains and marshes surrounding Tear. The Dres were also the Dunmer that enslaved and shipped slaves to the other Great Houses, keeping thousands of captives, mostly Argonians, in their infamous slave-pens of Tear and the surrounding plantations. House Dres is a society without generosity, innovation and luxury. They are xenophobic, hateful, and stern. Dres are the Dunmerest Dunmer, the ones who never smile. Even more so than other houses, the Dres are taciturn and unapproachable. Even rather insignificant things are considered hard-won knowledge that can only be shared within the Great House or even vassal minor House or family. Faction members will often refuse to give directions and asking them about "a little secret" will likely piss them off. The Dres have a deep-seated belief in their traditions, which are more ancient and less modern than any other house. They are dubious of change, of new inventions or new customs. They value hard work, and though their success has largely come as a result of shameful dealings, they regard it as the result of their hard work, a bit hypocritically. They do not indulge themselves like the Indoril & Hlaalu do. Their specific Tribunal is Sotha Sil. Destruction, Hand-to-hand, Illusion, Mercantile, Short Blade, Speechcraft.